Aaron Clough, owner of InnoMed, selected Eleanor Creative to brand the Ticket Offices inside the Pinnacle Bank Arena. 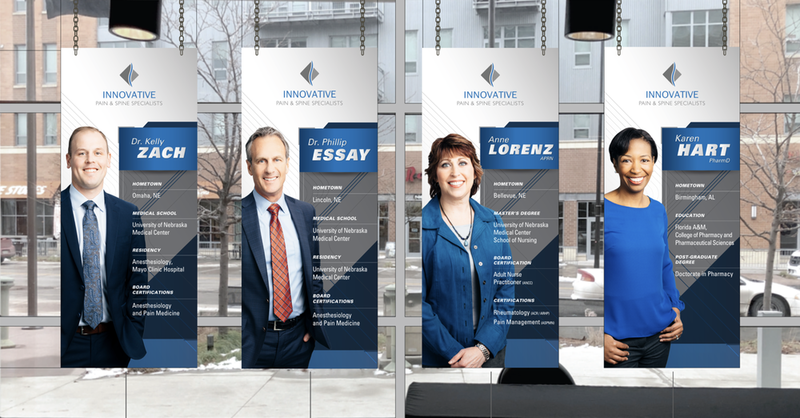 Together, we worked side-by-side on behalf of our client, Innovative Pain & Spine Specialists. Our goal with this project was to transform the PBA Ticket Offices into a modern space that truly reflected the talented work of the Innovative Pain & Spine Specialists team. Innovative Pain & Spine Specialists is committed to treating patients suffering from any type of acute or chronic pain and restoring them to their previous level of functionality. Dr. Zach and Dr. Essay are both trained to use medically proven and state of the art treatments for pain which include: medications, pain-relieving procedures, and rehabilitation. This project gave us the opportunity to work with the talented team at Nanonation. Together we created a “Spine Video Wall” in the lobby of the arena to allow us to showcase our client in an interactive format. 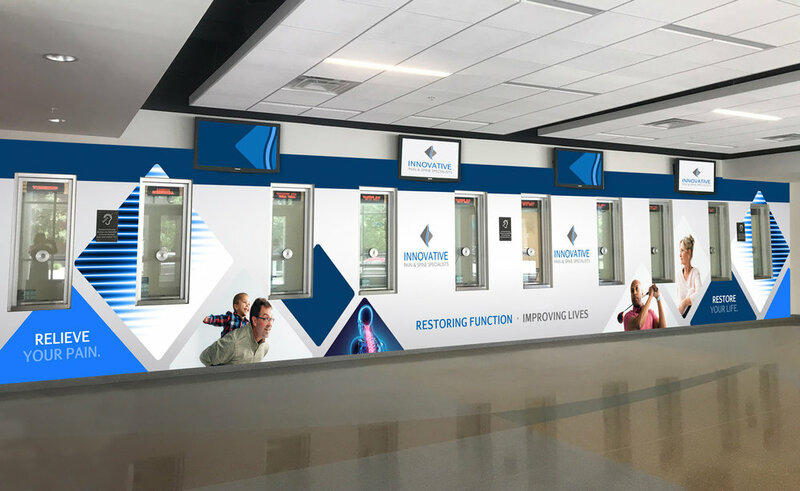 Innovative Pain & Spine Specialists came to Eleanor with the challenge of reimagining the Pinnacle Bank Arena Ticket Offices, inspired by a vision for an "Active and Pain-Free Community." 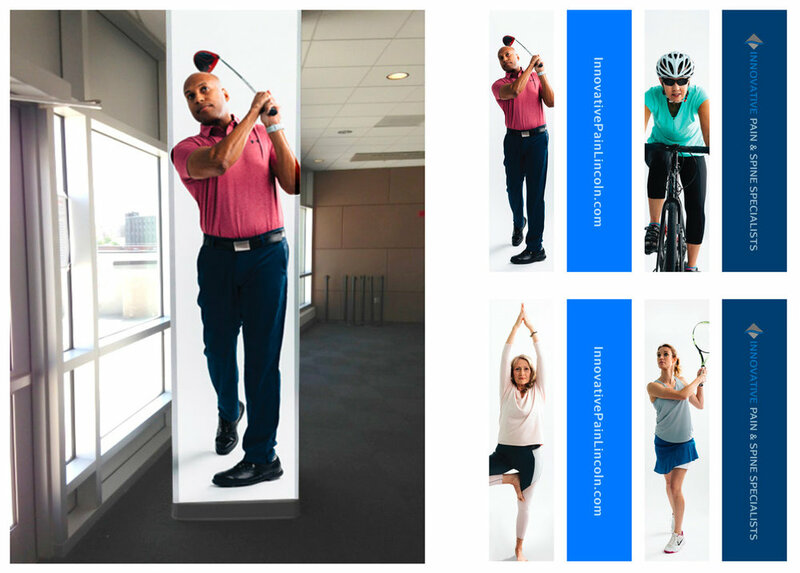 Using models from the Lincoln area captured by photographer Colin Conces in active states and our own brand of bright, bold design, we transformed the space and brought our client's identity into focus. Creating a “Sports Themed Display" of their team was a natural fit for our sport-loving arena! Planning, reviewing, designing, and negotiating were all key parts of this project. We are thankful for large scale projects like this that have a lasting design impact in our community. But more importantly, fostering relationships in our community that make our businesses stronger is at the heart of what we do.